If I was forced to compile a list of my ten favorite films of all time (not an easy task, I assure you), I don't think it would be complete without the inclusion of Tim Burton's Edward Scissorhands. I first saw it when I was about 10, and even then, the situations and themes dealt with in the film spoke to me. When I was younger I always loved fairytales. Not the happy "Disneyfied" ones, mind you. The dark, Brothers Grimm versions—the ones where Goldilocks has to be cut from the stomach of the bear. And with this film, I believe Tim Burton created a modern day fairytale. As with every Burton film I can think of (except, perhaps, the underrated Mars Attacks), the hero of this story is an outcast, trying to find his place in a world in which he does not belong. In this case, however, the so-called "normal" people are just as strange (or stranger) than Edward. The story begins with Peg Boggs (Dianne Wiest, The Bird Cage, Little Man Tate), an extremely persistent Avon lady, who has had a rather unsuccessful day peddling her wares to the trampish housewives in town. Refusing to accept defeat, Peg ventures up to the dark mansion that overlooks her small, suburban town. Inside the run-down old building, she discovers its very unusual occupant—Edward Scissorhands, so named because he has uh - ummm - scissors - for, you know, hands. Edward's face is scarred from years of nicks and cuts. It seems that Edward was the last project of an ailing inventor (Vincent Price, The Raven, Tales of Terror) who dies before he was able to give hands to his creation. Not one to neglect someone in need of a good makeover, Peg decides the only correct thing to do is to bring him home, to the suburbs. Boy, and I thought that MANSION was spooky - The town - yikes! At first, Edward is a big hit with everyone. From the inattentive husbands to the oversexed housewives, everyone wants to meet and greet Edward (and recommend a doctor that he should see). Edward is instantly curious about Peg's daughter, Kim (Winona Ryder, Dracula, Little Women), which, needless to say, does not make her tough-guy boyfriend (Anthony Michael Hall, The Breakfast Club) very happy. Edward becomes even MORE popular when the town discovers that his unusual medical problem makes it easy for him to construct works of art out of shrubbery (don't tell the Knights that say "Ni! "), hair and ice. Very soon, there isn't a single bush in town that is not shaped like a cat, a dinosaur, or a ballerina. Of course, things can't go this well forever. It all starts when one of the trampiest women in the town puts the moves on him, and Edward refuses her. From then on, things escalate from suspicion, to robbery, to arrest, until finally the effects of the suburban mindset are too much for the delicate Edward, and the film reaches its bittersweet conclusion. As odd as the story may sound, it comes off beautifully on screen. Edward's plight (he cannot touch anything without destroying it) can be seen as a metaphor for anyone who has ever been an outsider. The town's reactions to Edward are priceless—Burton has perfectly captured the "gaper's block" mentality of the modern community. His careful direction and visual style also play a large part in the film's success. Like Batman and Sleepy Hollow, Edward Scissorhands is a lavish production. Gothic castles contrast with all too perfect tract houses, and florescent green cars drive down streets lined with gigantic bushes carved into cats and penguins. The inventions in Edward's mansion have to be seen to be believed. The film, to me, is Burton's best. I feel that some of his other works (The Nightmare Before Christmas notwithstanding) were often a case of style over substance. Here, he melds a touching story, a brilliant satire on the modern suburban lifestyle, and amazing production design to create a film well on its way to becoming a classic. Image Transfer Review: The image on this disc is pleasing but not reference quality by any means. Framed at 1.85:1, this widescreen transfer exhibits excellent color contrast and black level (there is A LOT of black in this film) and very few visible artifacts. I noticed a bit of edge enhancement in the brighter scenes, but nothing too distracting, and some of the brighter outdoor scenes looked a tad soft. Overall, a decent picture for a 10 year old film, and anamorphic to boot! Audio Transfer Review: A 4.0 mix may seem odd, but the audio here is actually pretty good. Dialogue is centered in the center channel, and is clear and crisp. The music is spread nicely to the left and right main speakers and the surrounds, and sounded very clear, especially considering the extremely high notes in the score. As there is no LFE track, there is no real sub action, but the film doesn't really need it. Bottom line—this is a pleasant mix for an excellent film with a magnificent score. 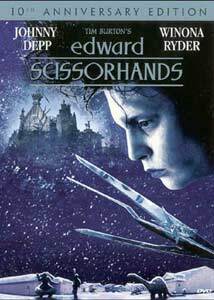 Extras Review: Edward Scissorhands is billed as the 10th Anniversary Edition, so some nice supplements can be expected. What is here, however, is a bit of a mixed bag. First of all, the commentary from Burton seems exciting - that is, if you've never heard a Burton commentary before. The man is a filmmaking genius, but he can't do a commentary worth squat. He offers a few interesting stories and explanations, but for the most part he sits silently for 5 minutes at a time. At one point I forgot I was watching the track. The isolated score with commentary by Danny Elfman is much better, and is my favorite extra on the disc. If you heard his commentary on Pee-Wee's Big Adventure, you know what to expect. Elfman is very talkative, and offers a lot of good information on the process of writing the score for this film. His clips are played during the parts of the film without music, so none of the score is lost. Also on the disc are a bunch of publicity materials from the time of the film's premiere. A ho-hum six minute featurette offers the usual studio promo crap with clips of the actors, but the open-ended interview section (from which the featurette drew its interviews) are a bit better. There are some interesting comments from the stars, and it is nice to see Vincent Price talking about his character. Finally, there are 4 conceptual drawings by Burton (far too few!) and the usual round-up of trailers and TV spots. All in all, not bad, but nothing too spectacular either. Many believe that Edward Scissorhands is Tim Burton's most personal film. Given that both he and Edward are tall and lanky and have wild hair, it is not difficult to see why. In the film, Edward is described as having an "altered perception of reality." Anyone who has ever seen a Burton film KNOWS that there is something not quite normal going on in Tim's head! If, in fact, the story was a sort of fantasy-autobiography, it is all the better for it. Burton has applied his life's experiences into a film that speaks to anyone who has been an outcast. Edward shows us that being different can be frightening, but it can also be beautiful. Highly, highly recommended.